The 2016 NCAA Men’s Basketball Tournament will be here before we know it. The process for the projected field of 68 teams begins March 13. The final remaining four teams from the East, South, Midwest and West will compete April 2nd & 4th for the national championship at NRG Stadium in Houston. 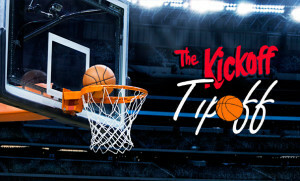 Since this is the first time we’ve branched into covering college basketball, the Tipoff, the Kickoff’s college basketball newsletter launched this season, really is a bit of a secret weapon because it isn’t something that everyone will have their hands on yet. We are dedicating this blog to telling you a little more about it. The Tipoff is published weekly and is packed with stats, schedules, scores and results for all 351 Division I teams. We break down the programs with our Tipoff 150 Power Ratings, similar to the system we use for our weekly college football picks during the fall. We’re offering a special deal if you want to start receiving the Tipoff but don’t care about getting back issues from earlier in the season. For a limited time, get a copy sent weekly to your email inbox for just $8 for eight weeks, leading up to the tournament. We can help you flesh out your brackets so you’re well-positioned to impress your friends with your knowledge of the sport. You can get a prorated subscription for the rest of basketball season by placing your order online or you can call us at (423) 267-0953 if you prefer to do it that way. You can also reach us by email at kickofforders@gmail.com. Some of the information you can expect to find in weekly issues of the Tipoff include our Power Ratings of the top 150 teams in America, a featured Game of the Week, a complete list of NCAA Division I Game schedules for the week, Performance of the Week, Field Goal Percentage Leaders, listings of NCAA Division I Conference Standings, Weekly Trends, RPI Standings, Team Defense Leaders, NCAA Scoring Leaders, NCAA Assist Leaders, NCAA Average Margin of Victory, NCAA Totals by Team, and much more! Because there are 351 Division I teams, our Tipoff newsletters are often 10-12 pages in size, literally packed with a wealth of information that no college basketball fan or prognosticator should be without! To coincide with the basketball tournament, we’ll also be choosing one lucky entrant to win a Polar Bear Cooler on April 1st (no foolin’!). Sign up for your chance to win at https://thekickoffstore.com/coolest-fan-contest/ – No purchase is necessary to enter. One entry per person please. Turning our attention back to college football, we publish six issues of The Kickoff between February and July. In our recently published February issue, we rated the Top 30 Recruiting Team Rankings (led by Alabama with four 5-star signees), the Top 30 Overall High School Prospects, listed 2016 Coaching Changes, listed Top High School Prospects by Position, listed NFL Draft Early Entrants, the Top 50 Junior College Prospects, and recapped the Top 30 Prospects and Top 20 Recruiting Classes from last season. As you can see, there’s plenty of college football action to talk about, even when the stadiums are quiet. Thanks for allowing us to bring you the best of college athletics! Sound off on social media… We want to know which team you think has the best shot in 2016! Let us know on Facebook, Twitter, Google+ and LinkedIn.